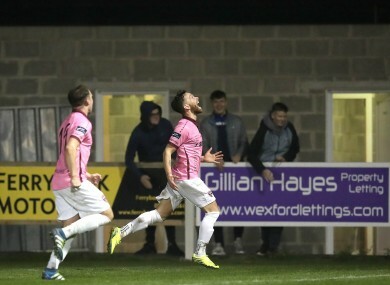 WEXFORD YOUTHS WILL take a two-goal advantage into the second leg of the promotion/relegation play off after a 2-0 win against Drogheda United in Ferrycarrig Park. Goals in the second half from Danny Furlong and Lee Chin give Shane Keegan’s side the advantage ahead of Friday’s second leg in Drogheda. The visitors started well and had three good chances inside the first 10 minutes. Adam Wixted crossed from the right and found Gareth McCaffrey; his effort needing a vital block from Chris Kenny to deny the in-form striker. Two minutes later Marc Griffin made space but curled across the face of goal, before United struck the woodwork. Richie Purdy made space in the middle of midfield and fired left footed but his effort came back off the bottom of Graham Doyle’s left-hand post. The crossbar was struck minutes later as United looked for an early lead. Griffin whipped in the corner from the left but Luke Gallagher saw his powerful header come back off the crossbar. The Youths finally came into the game after weathering the early storm and came close through Aidan Keenan. Craig McCabe’s long throw from the right caused problems and Keenan saw his header clawed away by the hand of Drogheda United keeper Stephen McGuinness, before the keeper did well to hold Chin’s header minutes later. Danny Furlong had a good chance for the home side as half-time approached. Aidan Keenan played the through ball to Furlong, but, after cutting inside, he couldn’t beat the excellent diving block of Stephen Dunne. Both sides had chances to grab the opener as the first half wore on. The visitors forced Doyle into a good, low save from Griffin after a great through ball from McCaffrey, before Keenan fired wide from a great position after a superb right-wing Paul Murphy cross. The home side started the second half well with Furlong firing across goal, before Bonner forced McGuinness into a smart save from his curling effort headed for the top corner. And the Youths broke the deadlock midway through the second half. Murphy played the through ball for his strike partner Furlong and he powered an unstoppable volley past McGuinness to give the Youths the lead. They almost doubled the advantage when Aidan Friel forced McGuinness into a good save, before Furlong’s rebound was brilliantly cleared off the line by Dunne. The visitors then broke straight down the other end; with Doyle alert to save from Jake Hyland. And as the time ticked into stoppage time, the home side grabbed a vital second goal. Craig McCabe’s throw in the first minute of stoppage time found Keenan on the left, his cross wasn’t cleared and Chin got to the dropping ball to volley brilliantly past McGuinness to give the Youths a 2-0 lead ahead of the second leg this Friday. Wexford Youths: Graham Doyle; Craig McCabe, Lee Grace, Chris Kenny, Andrew O’Connor; Conor Whittle (Aidan Friel 83), Jonny Bonner, Lee Chin, Aidan Keenan; Paul Murphy (Shane Dunne 90+3), Danny Furlong. Drogheda United: Stephen McGuinness, Colm Deasy, Kevin Farragher, Luke Gallagher, Stephen Dunne, Sean Thornton, Jake Hyland (John McKeown 90+2), Richie Purdy; Adam Wixted (Aaron Ashe 78), Marc Griffin (Sean Brennan 86), Gareth McCaffrey. Email “Lee Chin on target as Wexford edge towards Premier Division survival”. Feedback on “Lee Chin on target as Wexford edge towards Premier Division survival”.